The owner of a 19th Century folly in Kent is being served with a compulsory purchase order on the property because he is unable to pay £4m for repairs. Tonbridge and Malling council said it served Michael Kiesler with a repairs order but he did not have the funds. The council plan now involves restoring the storm-damaged tower and renting it out for short breaks to raise income. Mr Kiesler said the tower had been his home for 20 years and he still hoped to reach a deal with the authority. He wants to stay and repair it and also suggested he remains in the tower while running it as a business and providing short-term lettings in part of the building. He added that if the compulsory purchase went ahead, he would be entitled to the market value of the property by law, which five years ago was £2.8m. "I have asked the council to think it through properly and meetings are still to happen - I also would like to see it repaired," he said. The council said the tower's deterioration had been "marked and rapid since it sustained damage in the 1987 storm". The rescue plan involves taking the building into council ownership before it is transferred to the Vivat Trust, which would restore and operate the tower. The council said it had made a successful lottery bid for £2m for repairs and the Vivat Trust would raise the balance. 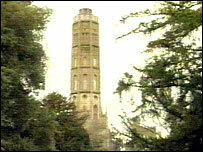 "There is an absolute determination to ensure Hadlow Tower is restored to its former glory and not allowed to fall to the ground bit by bit as is currently happening," a spokeswoman said. She added the council plan was subject to planning consent and listed building regulations. And she said Mr Kiesler could object to the compulsory purchase which would then lead to a public inquiry.